Nutricanis dry food is made using well-tolerated, completely grain-free/cereal-free recipes, which have been developed with the aid of nutritionists and veterinarians. It contains high-quality animal and vegetable ingredients that are good for your dog and supply him with everything he needs at every meal: proteins, carbohydrates, fibre, vitamins and minerals. With Nutricanis dry food, you can rest assured that you are contributing to a sensible and balanced diet for your beloved four-legged friend and helping him to stay healthy and fit for longer. Nutricanis dog food contains the best meat that not only tastes great but is also particularly high in animal protein (at least 25%), which help give your dog powerful muscles. All recipes are grain-free/cereal-free and free of gluten-containing ingredients, as these can cause intolerances and allergies. A carefully composed, balanced complex of vital ingredients actively supports the fitness level of your dog: The valuable omega-3 and omega-6 fatty acids come from the highest quality fish, flaxseed or canola oil. In addition to potatoes, our recipes contain other nutritious vegetables such as peas as optimal carbohydrate sources for energy production. Selected herbs and blueberries provide additional minerals and nutrients with antioxidant effects. As premium dog food, Nutricanis contains neither cheap fillers nor artificial flavour enhancers, preservatives, colouring agents or flavours, sugar or sweeteners. It can help provide a species-appropriate diet for dogs of any breed and size. 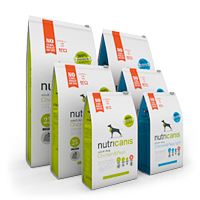 Nutricanis recipes are also available in low-fat and high-fibre variants for dogs with special dietary needs, such as dogs that tend to be overweight. A variety of package sizes, the practical zip-lock bag, express shipping within 24 hours and production in small batches help you to provide your dog with everything he needs and the freshest food possible.